Liberty tipped off its Big South Conference schedule on the road in South Carolina on Thursday taking on Presbyterian College. For the first time since Dec. 2, 2010, the Flames came away with a win in their first Big South game of the season, defeating the Blue Hose, 77-61, to improve to 6-8 on the season and 1-0 in league play. Ryan Kemrite led Liberty with 16 points and in its conference opener. The freshmen duo of Brock Gardner (11 points, four rebounds, one assist) and Georgie Pacheco-Ortiz (13 points, three rebounds, four assists) combined for 24 points, seven rebounds and five assists. Liberty’s top scoring defense in the Big South held Presbyterian six points below its season scoring average (67.4 points per game) thanks to limiting the Blue Hose to 28.0 percent shooting during the first half (7-of-25). Presbyterian (4-8, 0-1 BSC) finished the night shooting 44.0 percent (22-of-50). All but 12 of PC’s 61 points came from three players. J.C. Younger led the home team with 21 points, while Ed Drew came off the bench to net 16 points. Jo’Vontae Millner scored 12 points and led all players in the game with eight rebounds. Liberty’s stout defense also limited the Blue Hose from long range. PC came into the game shooting 37.7 percent from three-point range, but finished the night 3-of-18 from beyond the arc (3-of-18). Offensively, it was a slow start to the game for both teams as they struggled to score, combining for seven points in the first four and a half minutes. Gardner got things going for Liberty with back-to-back three’s that sparked a 15-0 run over the course of nearly six-minute period. During the run, the Flames nailed four three-pointers and on defense the Flames forced five turnovers while Presbyterian went 0-of-4 from the floor. The up-and-down offense continued for Liberty after its hot streak to take the lead. The Flames then were unable to score over a two-minute span as Presbyterian narrowed the gap 22-17 with five minutes left in the first half. As the offense had its highs and lows, the defense was consistent during the first 20 minutes of action, forcing 10 turnovers, which the Flames converted into nine points. Presbyterian was able to stay in the game due its free throw shooting, making 8-9 while Liberty went to free throw line twice during the first half with Pacheco-Ortiz making a pair. The Flames received nine points off their bench, outscoring the Blue Hose by a point in bench scoring during the first half, as well as forcing PC to shoot 28.0 percent from the floor. To close out the half, Lovell Cabbil would take the ball coast-to-coast for a running floater with four seconds left on the clock to give Liberty the 31-23 lead at half. Gardner led all scorers at half with 10 points and Cabbil pulled down a team-high four rebounds. 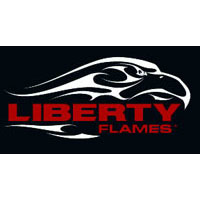 Kemrite got things started for Liberty scoring six of the Flames’ first eight points to begin the second half, extended their lead to 39-29. As Kemrite got it started, Pacheco-Ortiz took the torch midway through the second half with eight straight points including back-to-back three-pointers to extend Liberty’s lead to 50-33 with 12 minutes left in the game. The Flames used the three-point ball to their advantage with five from beyond the arc during the first nine minutes of the second half. During Liberty’s run from the three-point line, the offense was efficient with six assists. The Flames’ benched picked it up in the second half, scoring 11 points in the first 10 minutes of the second half. Ezra Talbert scored a quick five points in seven minutes to put Liberty up 58-38 with 10 minutes left in the game. The defensive clinic continued for the Liberty as it did not allow Presbyterian to score from the seven-minute mark all the way to just 3:56 left in the game that increased its lead to 70-50. The Flames will close out their first weekend in the Big South with a matchup on the road against Charleston Southern. Tip-off is set for 2 p.m. on Saturday at the Buc Dome.